The $90 million Honors College and Residences is the first of its kind in Indiana and among the nation’s most advanced academic residential colleges. The design for the 324,000-square-foot facility is tailored to fit the scholarly mission of the Purdue Honors College, and based on research about how high-ability students learn. The Honors College and Residences houses more than 800 students and is also home to the college itself, serving as a centralized hub for its administration and academic programs. Scholars are just steps away from their professors, advisers, the STEAM (science, technology, engineering, arts and agriculture, math) research lab and state-of-the-art “active learning” studios. They study in shared spaces aimed at fostering interaction and collaboration. Construction for the Honors College and Residences began in January 2015. The building utilized locally sourced materials and is seeking LEED certification. The LEED rating system is the foremost program for buildings that are designed, constructed, maintained and operated for improved environmental and human health performance. 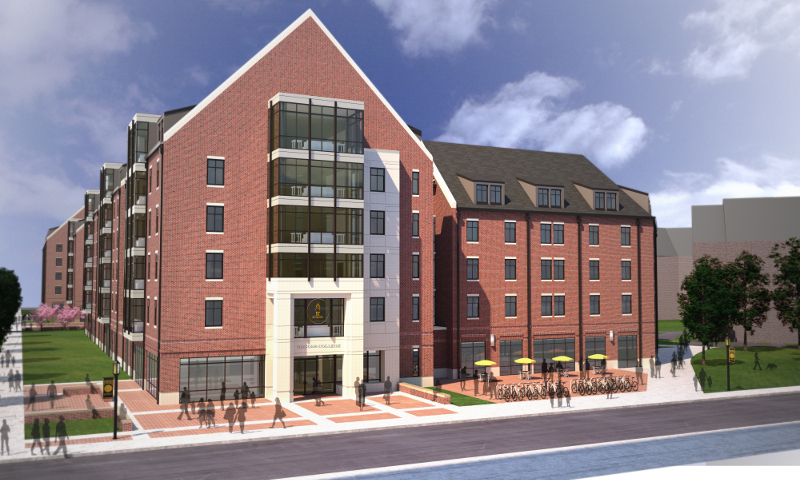 The Honors College and Residences will have an official dedication on Sept. 9, but it is already home to Honors College students, faculty and staff. Notable spaces include the Innovation Forum, with an interactive, programmable floor; the Computer Co-Lab, with bicycles that power laptops; an edible garden and the “crown jewel” of the Honors College, the Honors Hall. With its massive windows, a coffered ceiling, stage and space for nearly 300 people, the hall will serve as a central gathering point for programs and college functions.